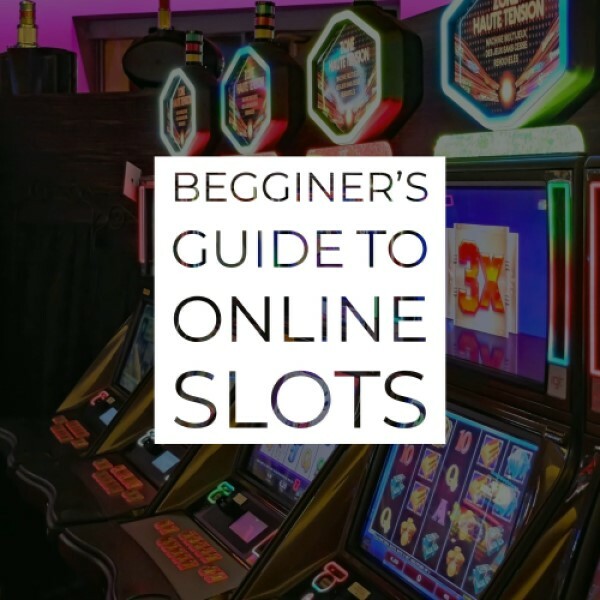 Nowadays, there are thousands of people that are eligible to plan online slot machines but haven’t even seen a land-based slot machine in their lives, nor felt what it’s like to insert a coin and pull the lever. With more than 10,000 online slot games in that many categories and inspirations and better and more innovative online slot games, we are going towards a bright future in the online gambling community. But when does it all start from? How did we get to the slot machines that we are currently spinning the reels on? 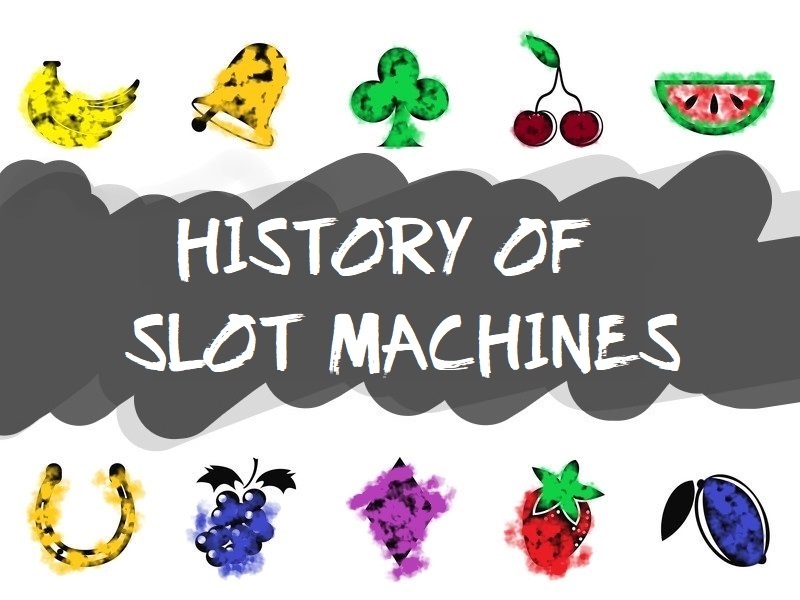 We have prepared a nice timeline of the slot machine history, so here goes nothing. Charles August Fey was a mechanic and enthusiastic gambler from Vöhringen, Bavaria, who spent his life in San Francisco, USA, and made one machine that started a whole movement. He started working in France and London before going to New Jersey to join the Electric Works company. He was amazed by the machine that Gustav Frederich Wilhelm Schultze invented called the Horseshoe Slot Machine in 1893, but the machine required attention when it came to payouts, and it usually paid in tokens and or tickets. This inspired Fey to modify and create a slot machine that will forever be remembered in the slots world as the first slot machine, and Fay was the name behind it. 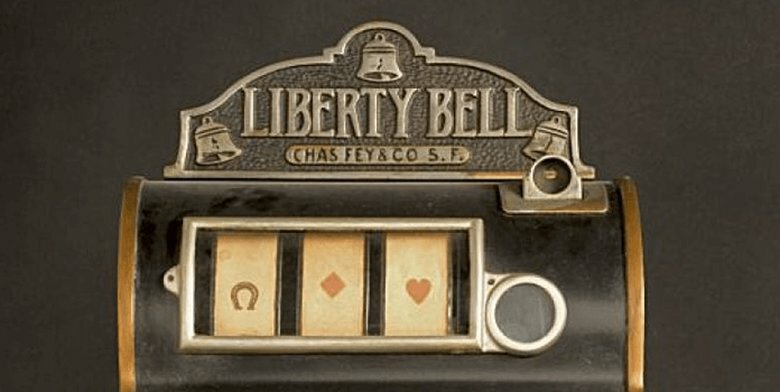 The Liberty Bell Slot Machine was a modified version of the Horseshoe Slot Machine that actually paid out coins instead of tickets and tokens. The Horseshoe used Poker Cards to match the winning combinations that paid out the prizes. The machine was also able to pay out on its own, without requiring the attention of a person to pay out the coins. This machine became incredibly popular and everything that we see nowadays is build with the Liberty Bell as a root. The year of creating this machine was in 1898, two years after Fey opened his slot machine workshop in the San Francisco, USA. It had only one payline and one winning combination – three of the Liberty Bell symbols in the middle of the 3×3 reels were paying out 50 cents. There were a total of five symbols. Because gambling was illegal at that time in San Francisco, there was no pattern to Fey’s machine, leading go many competitors stealing his idea. Because gambling was illegal in The States, immediately after the Liberty Bell, Sittman and Pitt developed a slot machine that paid out something other than cash, making it legal again. They would pay out cigarettes and beer for the ones landing winning combinations and returned to the poker cards as playing symbols. The bar was immediately placed in almost all the bars around San Francisco, and would pay out the goods from the bar it is in. Sittman and Pitt’s design comes from New York in 1891 and had five drums and a total of 50 playing cards. With a nickel, you could’ve won something from your desire that was located in the bar. This is where the slot machines got their lever, and it was used to be pulled by the player, which started the spinning of the reels. To increase the house edge, the ten of spades and jack of hearts were removed from the machine, making it twice harder to land a royal flash, taking the best goods from the bar. The machine lacked an automatic payout and the goods were picked at the bar once you made the winning combination. The machine pretty soon got several modifications and was used in stores as well, paying out chewing gums and other goods. The symbols in the slot machines were placed accordingly to the goods that were in the stores, so for example if you are spinning for a chewing gum, there is a slot with different symbol and colour, and you get the one that you make a combination with. The chewing gum slot machine goes under the name of Trade Stimulator. With the beginning of the 20th century, the slot machines, especially the Liberty Bell were completely banned from usage in the States. This made Fey’s life hard, but he didn’t stop manufacturing the Liberty Bell from the start. A new Chicago developer steps into play, and he is known by the name of Herbert Mills. Mills produced the very first fruit symbol slot machine, inspired by the banning of the cash payout from slot machines. He would modify the slot machine, and with few ideas that happened in the past, he would put fruits as symbols, paying out in chewing gums and sweets accordingly to the flavor of the symbol making the winning combination. The Slot Machine was called Operator Bell and was mostly used in most tobacconists, bowling alleys, shops, and salons. The interesting thing from this innovation in the slot machine history is that the company called Bell-Fruit used their logo as the symbol inside the slot machine, and it is still used nowadays, what we know as the BAR symbol. During this period of time, there were many slot inventions, modifications, variations and hundreds of symbols and paying types across the country, but one thing didn’t change – the slots remained purely mechanical. To start spinning the reels, you needed to pull the trigger on the right-hand side of the machine, setting the reels in motion and stopping after a few spins. These slot machines got its nickname as the One-Armed Bandits. Because of the lever that they needed to pull, it gave the sensation that you can control the spinning by adjusting the force, and that’s why they were so popular and went viral in the past. But the thing is, you couldn’t control it, hence the One-Armed Bandits being the name, as it would take away a lot more than give back to the players, who hoped for a better income. 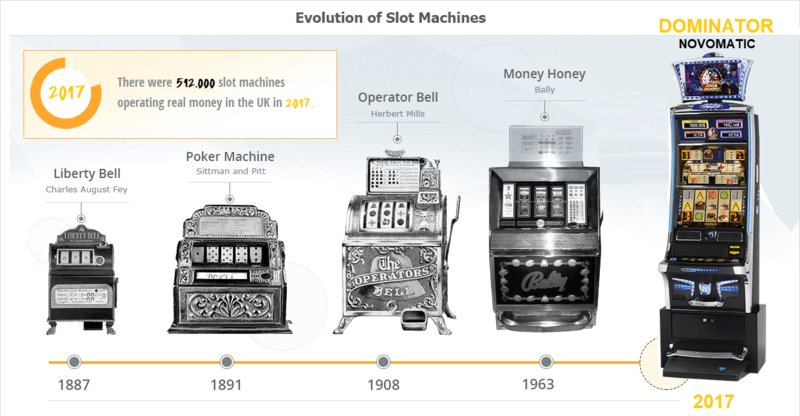 In 1964, the big breakthrough in the slot machine history happened, with creating the very first electromechanical slot machine called Money Honey. Bally were the masterminds behind this innovation, and the reels were completely electronic. However, you would still need to pull the lever to start spinning the reels, as it would have had no sense for the slot players back in the days to have a machine without a lever. The machine had a bottomless hopper which meant an automatic payout would pay out the ash on its own, paying out to 500 coins initially. Money Honey became incredibly popular, and electromechanical slot machines showed their supremacy and power in the world. The interesting thing here is that the levers were soon removed from the slot machines in the new electromechanical slots. The very first video slot was developed in 1976 and it was manufactured by the Las Vegas company named Fortune Coin which used a 19-inch Sony monitor as a display. The slot machine was positioned in the Las Vegas Hilton Hotel and there was only one machine that was overcrowded. Soon after all the bugs and cheat-proofing modifications were made, the Nevada State Gaming Commission put a green light and the machine started manufacturing, populating every single corner in Las Vegas. IGT steps in the game as one of the gambling giants, buying the machine rights and continuing the manufacturing, with some minor changes to it. The next step in the slot machine history was taken by WMS Industry, who created the first video slot that featured the second screen after you successfully land a winning combination for the bonus feature in the game. It was called Reel ‘Em and it was one of a kind, inspiring almost every single bonus feature that we have nowadays. As soon as you landed a bonus feature combination, the machine takes you to a completely new second screen where the bonus feature took place. Much more prizes could be won in the bonus feature, which is the case with most of the slot games now, and because of this innovation, the slot games become very popular in 1996. The slot machines took 70% of the floor spacing of every casino in Nevada and the States, and they would make up to 70% of the overall casino income. In the meantime, while Reel ‘Em was making a history, online gambling started to make some small progress throughout the years. It was the traditional casino table games that got their first version online, but the slots followed with a faster tempo. Soon, the slots become more popular than the table games like Roulette and Blackjack, leaving their competitive casino games behind. The very money wager in an online casino was in 1996 at InterCasino – a brand that’s still popular today. It offered only a few tables and slot games, not more than 20, and was an innovation that was followed by almost all of the major land-based casinos, as the potential was limitless. In the beginning, the style was same as the land-based slot machines – three reels one paylines and the same symbols that were used throughout the history, meaning mostly fruits, sevens, bars, cherries, bells and few other symbols. As time passed by and the game producing companies begin to understand that there is much more than three reels and one payline, the first five reeled slots appeared, with an increased number of paylines, up to nine. Nowadays, there are slots with a double set of reels, several thousands of paylines and symbols beyond our imagination. There is a combination of symbols on multiple positions, and bonus features that are mini-games on their own, making our slot machine experience a bright one. Another interesting milestone in the slot machine history is the Jackpot Slots. The very first jackpot slot was the Cash Splash from Microgaming, offering the highest payouts, never seen before. Everybody was crazy playing this slot, hoping to land the right winning combination and grab the life-changing real money. Soon after, all of the slot producers followed this example, therefore we can now see many jackpot slots, and even progressive jackpot slots, a modified version of the jackpot slots with higher payouts. One milestone with high payouts is Mega Moolah slot, paying out 17.9 Million. Today, there are more than 200 gaming producers with more than 10,000 slot games on the most unique topics you can find, where you can get life-changing rewards and enjoy the fun of the reels, sounds, symbols and unique bonus features. Find a Propper Casino with our Best Promotions to see what we have prepared for you.